Chichester’s men’s first team turned in a spirited performance in a 1-1 draw at home to league leaders Birmingham University ahead of their much anticipated EH Championship (formerly the National Cup) quarter-final against Cheltenham this Sunday. It was a fine return to form that will have heartened players and spectators alike as the team had until that point been searching to rekindle the performances that saw them on a fantastic run of result ahead of the Christmas break. With the team under pressure from injuries and absences, and perhaps lacking some confidence following some telling losses in previous weeks, it was time for their leaders to stand up and be counted. Captain Alex Thakore led the way, both with his first goal of the league campaign and a solid performance at full-back. He was ably supported by former captain Kieran Henn, Alex and Ollie Baxter – who came close to scoring a winner on a couple of occasions – Dan Brook, Alex Holton, Alex Messenger and Alex Pendle who, based on current performance, will certainly grace an England senior shirt before long. Ahead of the quarter final, Chichester will travel to Bristol on Saturday to follow up their league performance with a win against another university side, but many thoughts will inevitably be on the team’s bid to return to a domestic cup semi-final. Cheltenham are old acquaintances, having been in the National League West with Chichester previously. They will provide another stern test, but one that the team will now be much more confident in meeting. Ever since Chichester’s lost the National Cup final at the National Hockey Stadium, the EH Championship holds a special place in the hearts and minds of everyone at the club. Sunday will be much anticipated for precisely that reason. 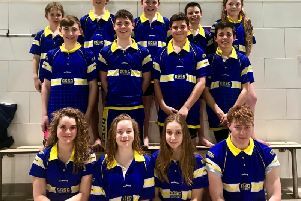 The team will hope they can count on a huge amount of local support in their efforts to get back in the national limelight, and would warmly invite any spectators ahead of the 1pm push-back at Chichester College. This was a crunch match as Worthing are bottom of the table and Chichester just above them – and Chi took the win. The game started with both sides eager to get the upper hand. Amy Gilmour came into the side and had a great game. Xenia Trueman and Rachel Trent were moving well, trying to unsettle the Worthing defence, and were boosted when Charlotte Stemp came on. The first goal came from some great defensive work and the ball was worked to Trueman – she made a superb pass to Trent, who dribbled round the keeper to score. Worthing put Chi under pressure but with Kate Woods and Jackie Baxter at the back, they found it difficult to penetrate the home side’s D.
Chichester lost concentration for a moment, leaving a Worthing player alone in the circle leaving Charlotte O’Callaghan no chance. In the second half, Chi were under more pressure mainly through not keeping possession. Chi stood firm and with excellent dribbling skills Trueman got the winner from an acute angle. Chichester: O’Callaghan, Austin, Parrott, Stemp, Gilmour, Baxter, Trent, Hurd, Woods, Oliver- Catt, Hallier, Trueman. Chichester ended up well beaten at Camberley. With only 11 players Chi were aware they needed to play well and let the ball do the work. Chichester started well with Neil Pendle linking well with the forward line to win the first penalty corner. With the ball injected quickly and stopped, Connor Todd fired a drag-flick goalwards only for it to hit the crossbar and drop down for a defender to clear. A couple more attacks from Chichester followed but the Camberley defence and keeper held firm. Camberley were rotating their players and their fresh legs meant Chichester started to struggle and allowed Camberley to win a series of penalty corners. They converted one and the momentum swung and Camberley scored an open-play goal and won a penalty stroke from another open play attack which Chichester goal keeper Dave Kirby saved brilliantly. Chichester regrouped for the second half but started giving the ball away which Camberley took full advantage of to win a series of penalty corners. Another penalty stroke was awarded and converted. The game became scrappy and finished with Camberley scoring their fourth. On a very difficult day for availability, the Friars had only ten players. They decided to take a positive attacking tactical approach, playing three at the back. From the start, the team showed their intent by taking firm control of midfield. It was against the run of play when Andover broke out after ten minutes with a sweeping move to take the lead. The Friars stuck to the game plan, enjoying most of the possession. They were rewarded with the equaliser on 14 minutes when Tracey Boyce tapped the ball in on the reverse stick after a great run and pass by Gareth Wharton. Andover only occasionally got out of their own half but unable to break through the Friars defence. Several close chances came the way of the Friars who took the lead on 22 minutes when Dave Walters picked up the loose ball at a short corner and slotted through a narrow gap. At half-time the team were getting tired but were determined to carry on with the same approach in the second half. And it worked. Several chances came and went, with the Andover keeper pulling off good saves. Gareth Wharton got the well-deserved third on 42 minutes with an open play shot. The final goal came after 45 minutes when Andrew Savory roofed a penalty flick, giving the keeper no chance. The remainder of the game was about control as the Friars tired. Rob Torrance in goal made several good saves to keep the pressure off. This was an impressive performance under difficult circumstances, with the whole team putting in incredible effort. Great credit goes to Martin Hughes for his organising and talking to the team. Andrew Osbourne and Danny Jaeger were very strong at the back. Walters, Steve Grey and Ian Wilkins covered a huge amount of ground and put in countless tackles. Andrew Savory pretty much controlled the midfield and Wharton and Boyce defended high and always gave options up front. Friars: R Torrance, D Walters, M Hughes, D Jaeger, T Boyce, G Wharton, A Osbourne, A Savory, I Wilkins, S Gray. A break from action didn’t stop Chi Ladies fourths from continuing their winning run. Chi’s teamwork was strong with communication clear. Some great runs from Heidi Johnson, Rachel Austin, Sarah Whittington and Mandy Clark up the wings had Yateley on the back foot but their keeper prevented early goals. Caroline Homer, Kim Howarth and Teresa Willway dominated the cente and Yateley could only break through when they had a free hit. The defence of Mel Litchefield, Gillian Ashton, Debs Cox, Elaine Cruttenden and Chris Priddle maintained their positions and Char O’Callaghan produced a couple of clean saves. A great cross from Austin allowed Homer to strike at goal. This spurred on Chi and a cross by Johnson on the reverse stick was converted at height by Homer to hit the backboard. A tactical half-ime talk brought on more of the same from Chi with Clark and Homer playing well. Selfless play from the Chi attack meant Austin was waiting to hit in the third and Johnson bagged the fourth. Chi can take pride from their all-round performance. Chi Ladies 4s: O’Callaghan, Cox, Priddle, Cruttenden, Ashton, Whittington, Licthfield, Howarth, Johnson, Austin, Clark, Homer, Willway.